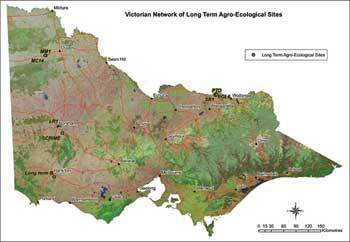 The LTAE’s form a network of research sites across agro-ecological zones of rain-fed agricultural land in Victoria. Agro-ecological zones are defined combinations of soil, landform and climatic characteristics. The LTAE network includes research sites at Hamilton, Horsham, Rutherglen and Walpeup. Long term research trials are extremely important to monitor change and quantify any impacts of land management on soil and agricultural production. Many soil properties and processes may change slowly (e.g. pH, soil organic matter, microbial diversity), or may change rapidly once a threshold is reached. Monitoring change over long periods of time provides a unique opportunity to evaluate biological, biogeochemical and environmental changes to assist us to understand agricultural sustainability, predict impacts of climate variability, and to validate computer simulation models of crop and pasture production and landscape processes (Rasmussen et al. 1998). Data from the LTAE’s has been recently used for assessing Australia’s soil carbon stocks and how agronomic management can affect soil carbon. The LTAE’s are also an important resource as ‘field laboratories’ for college and university students and farmer groups. The Victorian LTAE model has international equivalents in the USA and in Europe. The USA National Science Foundation has long term ecological research sites at locations such as Michigan State University, while in Europe the global terrestrial ecosystems network includes long term trial locations like the Rothamsted Research Institute in England. The LTAE sites underwent a rigorous review process in 2003 that made several important recommendations for their future use with regard to researchers, stakeholders, and the public good value for the community (Crawford et al. 2003). The SCRIME experiment was established in 1998 at Longerenong in western Victoria to investigate cropping systems in relation to the soil resource (chemical, physical and biological); financial performance; and pest and disease management. The agro-ecological context of this site is a rain-fed cropping system within the Wimmera, which is a semi-arid (average 414 mm of annual rainfall) Mediterranean type environment. The LR1 experiment was established in 1916 at Longerenong in western Victoria to investigate the suitability of various cropping rotations on soil fertility. The agro-ecological context of this site is a rain-fed cropping system within the Wimmera, which is a semi-arid (average 414 mm of annual rainfall) Mediterranean type environment. The MC14 experiment was established in 1985 at Walpeup in north-western Victoria to compare the long term effects of rotation and fallow management on wheat production in the Mallee. The agro-ecological context of this site is a rain-fed cropping system within the Mallee, which is a semi-arid (average 334 mm of annual rainfall) Mediterranean type environment. The MM1 experiment was established in 1943 at Walpeup in north-western Victoria to compare the long term effect of superphosphate on wheat yield response in the Mallee. The agro-ecological context of this site is a rain-fed cropping systems within the Mallee, which is a semi-arid (average 334 mm of annual rainfall) Mediterranean type environment. The PTD experiment was established in 1914 at Rutherglen in north-eastern Victoria to identify the long term effects of superphosphate application on pasture and animal production. The agro-ecological context of this site is a grazing system within a region of mixed farming at Rutherglen and an annual average rainfall of 582 mm. The LTPE was established in 1977 at Hamilton in south-western Victoria to demonstrate the potential carrying capacity of improved pasture with increased phosphorus. This experiment is also monitoring wool quality, soil acidification and soil compaction. The agro-ecological context of this site is a grazing system within a region of mixed farming at Hamilton with 686 mm annual average rainfall in a Mediterranean type environment. Crawford MC, Sonogan R, Unkovich M and Yunusa IAM (2003) ‘Review of Long-term Agronomic Experiments in Victoria’. Department of Natural Resources and Environment, Victoria. Rasmussen PE, Goulding KWT, Brown JR, Grace PR, Janzen HH and Körschens M (1998) Long-term agroecosystem experiments: Assessing agricultural sustainability and global change. Science 282, 893-896. Funding provided by the Department of Environment Primary Industries (Key Project FF104: Accountable Agriculture) through the project ‘Understanding soil and farming systems’.